I have done a few different and new patterns to me. Actually, they were all acquired earlier in the winter, but I just recently had a client that either chose them, or received a quilt I felt that they were well suited for. In the last few hours before I left on vacation to the Cape, I received Andrea's last wedding quilt. It was actually pieced by her mom, sent to me for the 2 day turn-around quilting, and then back to Andrea for binding before the big event this coming weekend. This is stitched with a neutral tan SoFine thread, Bottomline bobbin. 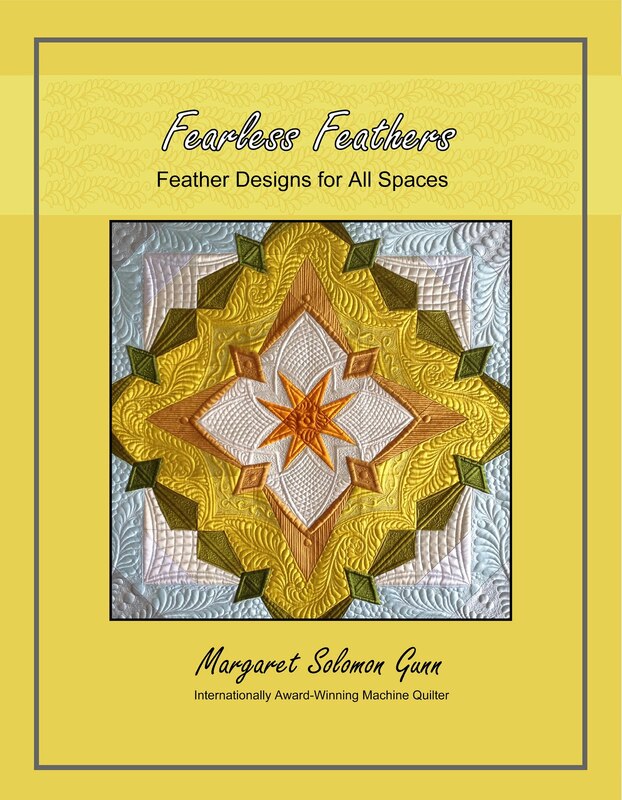 The pattern is Feather Meander by Linda Taylor. I had actually been avoiding using it, as I thought it might be dense and time consuming, but I so totally love it. It reminds me of a front-side freehand E2E that I do, but I just wanted to give the pattern a try. It will be used often. It is a wide pattern too - 14" I think. Here's yet another batik quilt in gorgeous greens and purples. I have used this pattern a time or two this year, but it's a nice one for this quilt. It is Woodlands, and is a rather dense leafy design. I used once again a SoFine thread in the top and bobbin, in a fuscia color (like the inner border). The thread does not appear to show because the lighting for the picture was miserable, but it does show as pink against the plum backing. It is dense - many bobbins used. The last pattern, again for one of the wedding quilts, is called Angel Wings. I chose a bright orange thread, again SoFine. Although it is being given at her wedding, it is actually a baby's quilt, with the gender unknown. The orange is a bold choice, but definitely relatively gender-neutral, and it does show up nicely without being bright red hearts all over the quilt. 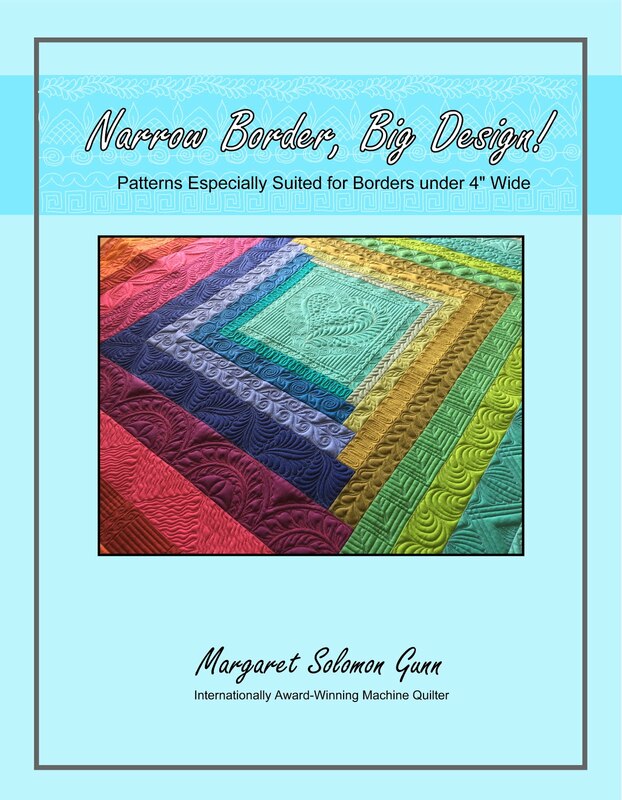 This is a loose pattern and does quilt up relatively fast. I prefer the patterns to "interlock" more so that there is not the obvious look of hearts all in a row (aka - more like the Feather Meander I showed first), but that is life. It's delicate, without making a stiff quilt. So I am now back from vacation, a week on the Cape, visiting what are really quite nice beaches daily even by my more Caribbean standards. All 3 kids are in school - even my youngest goes for the afternoon. My machine is home from its annual servicing, and I am easing into the notion of having 3 uninterrupted hours of sewing every afternoon without question. I have some client committments, as well as things of my own to finish up. My quilt going to MQX West is nearing completion (should be since the show is a month away). I also have no less than 4 others in the works. First up....a 40" wholecloth, all marked and ready. Just one semi-custom ahead of it. Oh, did I mention that the wholecloth is silk? Yikes. That is where the nerves kick in, and the ever-present quandry of what color thread to use. I started teaching my oldest how to sew a couple weeks ago and he is chomping at the bit to do more. That is on Saturday's agenda. So much fun, so little time! Visit back in a day or so and I will show a few more snippets of what I have been up to. Earlier this month before I left on vacation, I quilted several quilts. In this time, I was able to test out a couple of threads that are new to my repetoire. Typically, I sew most of the time with Superior's So Fine thread on the top and their Bottomline or SoFine in the bobbin. This combination works without breaks and issues. At MQX in April, I received a cone of Superior's Omni 40wt poly thread. I finally had a quilt that seemed perfect to try it out on. This is one of Andrea's wedding quilts, one of 13 that are being given to her attendents next weekend. Thank goodness for her it is next weekend, as we are all awaiting the arrival of Irene tomorrow! 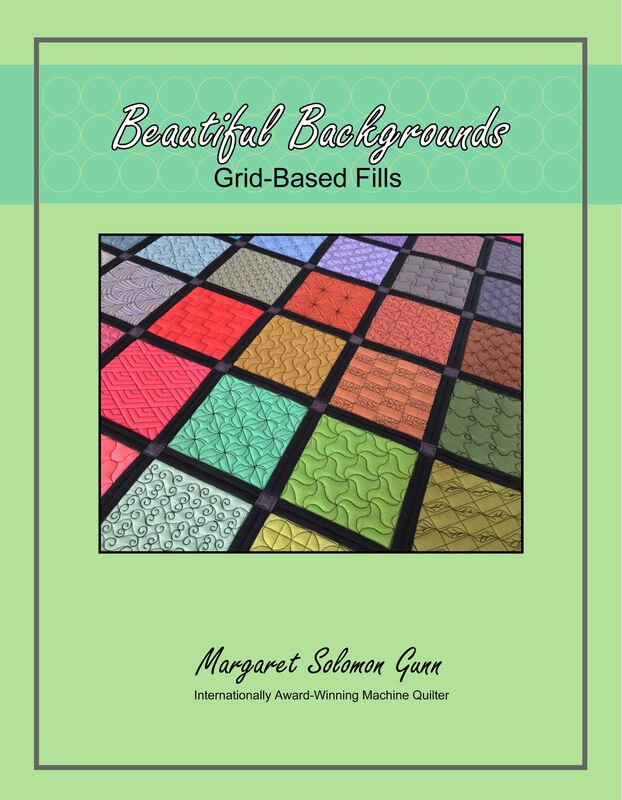 The thread is strong, very suitable for pantographs and all-over quilting designs. In my opinion, it is too heavy for detail work, but good for many other places. I have a cone of tan, so the color was right here too. The thread has little sheen, like some other poly threads, but looks good, and ran without so much as a break. It required an 18 needle, so I did stock up on these at the World Quilt Show 2 weeks ago, and plan to order a few cones of the Omni with my next Superior order. It's run with Bottomline in the bobbin. Oh, and the best part is that it comes in 6000yd cones, 172 colors and has a price of $7.70 for the business owner ($12 for everyone else). The other thread I stitched with for the first time is Wonderfil's Tutti, 50wt cotton thread. 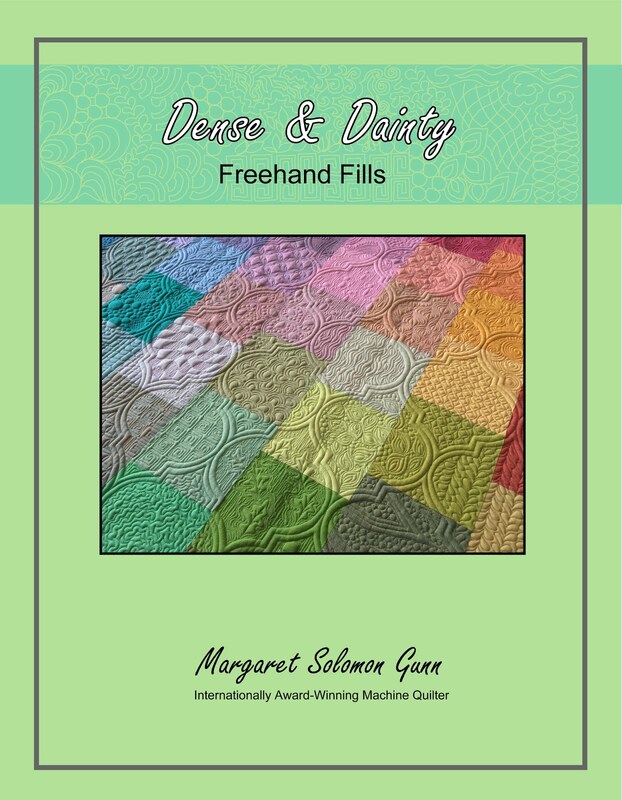 I got a cone of green last month with my MQS gift certificate, and figured I'd just test it out, along with several other threads to see what I want to buy with the remaining $700 of the award. Seriously...how much thread can one person buy?>?! I ran this thread with a matching So Fine in the bobbin. I seldomly quilt with cotton thread because it generates so much lint, but this was relatively low lint as cottons go. It is a fairly fine thread too, and looks nice as a panto. I think I stitched with an 18 needle as well. I did have 5-6 thread breaks, which are annoying and slightly disruptive, but I'd be inclined to get a few cones of this thread too for E2E work. It runs $28 for 3000m - more expensive than most other comparative cotton threads, but since mine will be essentially "free", I will likely get some. Yes, you read that correctly. Half. HALF! Am I not the world's largest blooming idiot? I drove 2 hours each way to go to this show today, only to get back home and discover that half of the quilts were off in another hall...yes, the top show winners to boot. I am so freaking livid at myself for not looking at the program while I was there. I thought I was doing fine just looking at the quilts, but I suppose I am the fool for thinking so. Looks like Handi Quilter and the truck were there too. One more thing missed! Below, is Marilyn Bedford's, which did win something. This next ocean sceen was very neat to look at how it was constructed. Didn't photograph so interestingly. This quilt has words and phrases quilted into the background about aging. Just plain colorful and cool. This had an abundance or nicely placed micro-pipings on the top, and very nice quilting around the trapunto butterflies. I believe this was Germany's top entrant. The eagle/bird is done with just quilting. There were lots of "artsy" type quilts. Here's one. Some type of thistle. ...and a close up of the thistle - very neat. Love the simple elegance of this trilogy. Though I'd have quilted this more, it is probably one of my favorites of the day. So sweet and innocent. RaNae Merrill's quilt - too many teeny tiny pieces here! This was a display quilt I like. So I missed all the Japanese and Israeli quilts and the top winners. Dumbo! The Japanese usually make very intricate quilts too. I left the show thinking it was vendor-heavy, lacking more of the quilts I like to see. There were way too many artsy-fartsy quilts. You know the kind, put together with pounds of fusible, then there's string couched on top, then some tulle, and enough embellishment to gag a herd of animals. They can be attractive, but I like to think that quilts are still made with sewing machines and not irons. My opinions aside, there were LOTS of these type quilts. I kind of figured I'd not ever submit a quilt to this show just because my point of view is so vastly different from what I saw today. I have since seen the winners and some other quilts and realized I am just the idiot for missing half the show! In fact the person that won the traditional category was somebody that had the very same quilt at the Maine Quilt Show 2 weeks ago. Maybe I will reconsider sending something here in another year. We'll just get to the top winner. This is Linda Roy's Vintage Button Bouquet, and it is more than fitting for the Best in Show. It's amazing, hand quilted, hand rouched, tons of circles, micro quilted and then some. Can't even fathom doing all that hand quilting. And I do come from a hand quilting background, but this is insane. That cross-hatching may be at most 1/2" apart. This is Linda Laine Banner's William Morris Autumn, and it received the Exemplary Applique Award. If I am not mistaken, it said that she made this for the Joann contest. I remember reading about who won this some months ago, and it was not this quilt...hard to believe since this is lovely! And made from Joann fabrics! Here's Armelia Spinello's Splendiferous, and it is. It's made with all silks, and just shimmers under the show lights. Just Beautiful. And lastly, the Best Use of Color and Pictorial Winner is Medea Escaping by Marilyn Bedford. How do these people eved dream these things up?? They are so amazing. And this is large too, so it creates a very ominous feeling looking at it. As I said before, the quilts at this show were great to see. Many familiar names, and many new ones. It was awesome to see some of the works of well known award-winning quilters up close. Yes, there were many more that I did not show; sorry...only so much time for filtering through pictures this week. 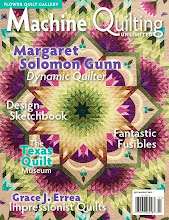 I am off to the New England World Quilt Show on Thursday too. Phew! Overload! The picture is fuzzy. Despite this auditorium being lovely for the quilts, the lighting is horrendous. The quilt's name is "Beth I hear you calling". She's used the heavily printed fabrics brilliantly, with black as a cohesive accent. 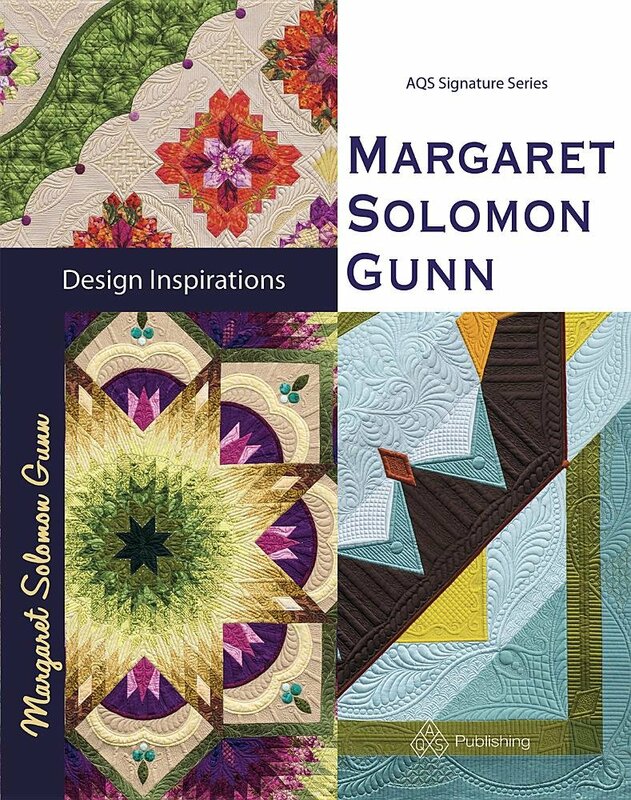 I was able to create secondary quilting designs amidst her stars and piecing. I really love the square bands of pebbles. There are plenty of feathers to keep with the very romantic feel of the fabrics. But I also like to throw in the juxtiposition of straight-line beadboarding and curved cross-hatching to break up the flowy feathers. The inner red border took the proverbial forever, with the pebbles outlining the egg-dart motifs. Simple and classic, with a twist. The end result was a lovely quilt. Did I say how proud I am of her? Wow. For the curious ones...this is all Superior So Fine thread and memory has failed me as to whether it has an additional poly batt on top of the usual 80/20 Hobbs. Gosh, my memory is goig, but I do think I did add the additional batting to show off the quilting. This is Janet-Lee Santeusanio's Rosebud quilt. It's simple, classic piecing, and typically Janet-Lee lovely quilting. For those of you that don't know, she is the longarming coordinator of MQX. How does she have the time to quilt?? Her quilt took Honorable mention, after Sandy's. This Lion quilt is incredible. Up close, it's hard to see the design. From 10 feet away, it's awesome. "El Jefe" by Grace Errea. "Moonlit Sky" by Jenny Boucher is adorned with an absolute ton of crystals. I needed sun glasses to look at it it twinkled so much. The quilting looked oddly familiar when I first saw it. Then I realized it was done by Judi Madsen (aka Green Fairy). I love seeing her quilting, but she hasn't been showing much of it lately on account of other projects. I've not photographed the quilt number of the next one. It's a gorgeous combination of blues you might not instinctively use together, but yet go together wonderfully. And a closeup of the block that she did a simple kaleidoscope block of (also the border fabric). This next one is all hand quilted and has amazing color gradations. "A Peruvian Tapestry: Women of the Andes" is by Betty Taylor. No show would be complete without a Baltimore album quilt. This is massive applique with lots of hand quilting "And DAR Visits Rhode Island" by Brenda Devine, earning a 3rd place ribbon. Hard to believe. Oops, no quilt credits...sorry. It's lovely! This is by Louisa Smith (of Strips-n-Curves). The colors are lovely...lots of pieces. "Painted Leaves"
This is only a small part of this quilt, and it was hand quilted! "The Tsar's Decree" by Megan Farcas. It has lovely movement and twinkled. That's all for now. 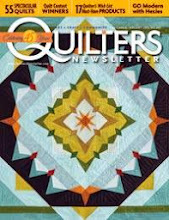 In the next few days, there will be lots of pictures of the winner's circle quilts and the ones I have not shown yet. Top winners were Amazing, and make me drool.